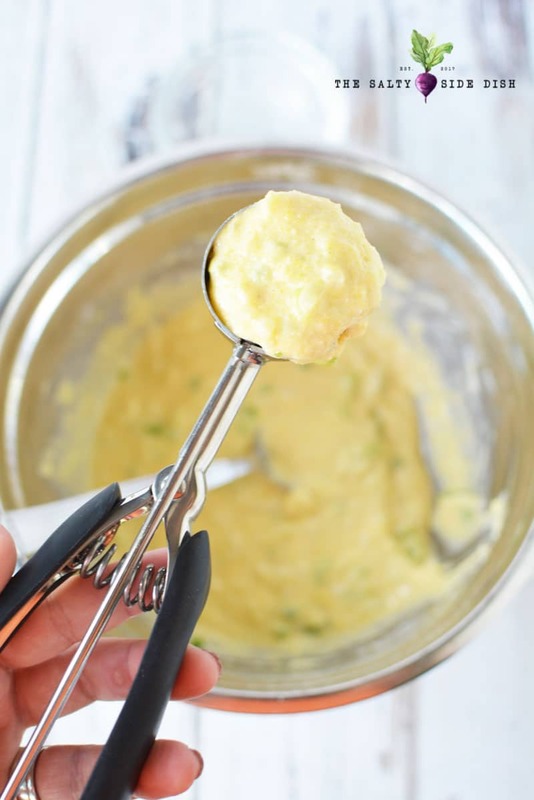 Making hush puppies is easier than you think. These mini fried balls of cornmeal dough can seriously make a meal. As a side dish, its easy to grab, goes with a ton of recipes, and who can resist a mini fried piece of bread, kwim? 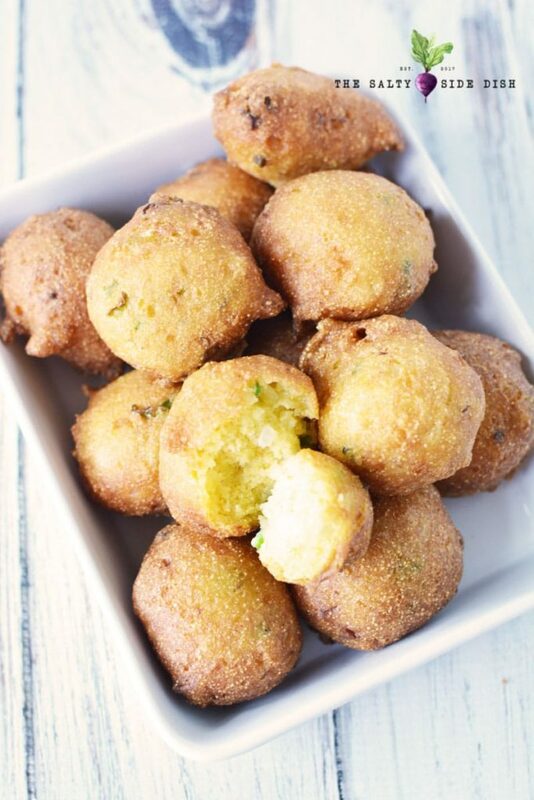 Print off my hush puppies recipe below and get started to a mouthwatering bite in minutes! Golden brown and the perfect amount of crispy crunch, these mix and go hush puppies are delightfully easy to prepare and can feed an entire crowd. Often served along side a cat fish fry, hush puppies are a must have at any classic southern meal. 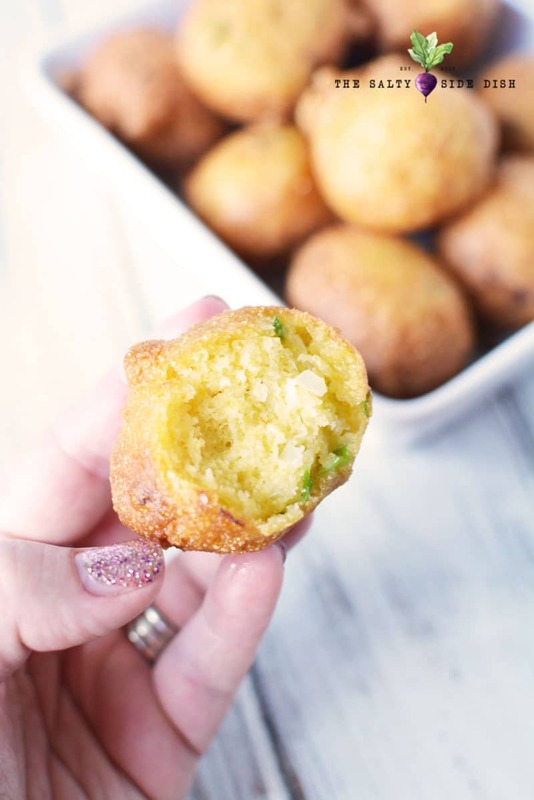 Timeless and a bit retro, this hush puppy recipe is true to its roots and I hope you love this perfect delicacy. Looking for more great recipes to serve up to a crowd? Try Carrot Salad or this homemade red sangria! These hush puppies are easy to make. Time is minimal to mix up, maybe 10 minute by the time you cut the onions. Cooking is done often in batches, so that can take a little more time. One batch for me was about 5 hush puppies and I cooked them for 5-7 minutes each batch. There is sugar in these, so they have a little sweet to them. Dietary Changes: You can make these gluten free by altering the flour to a Gluten Free option like King Arthur’s Gluten Free. Heat at least 2″ of vegetable oil until hot. 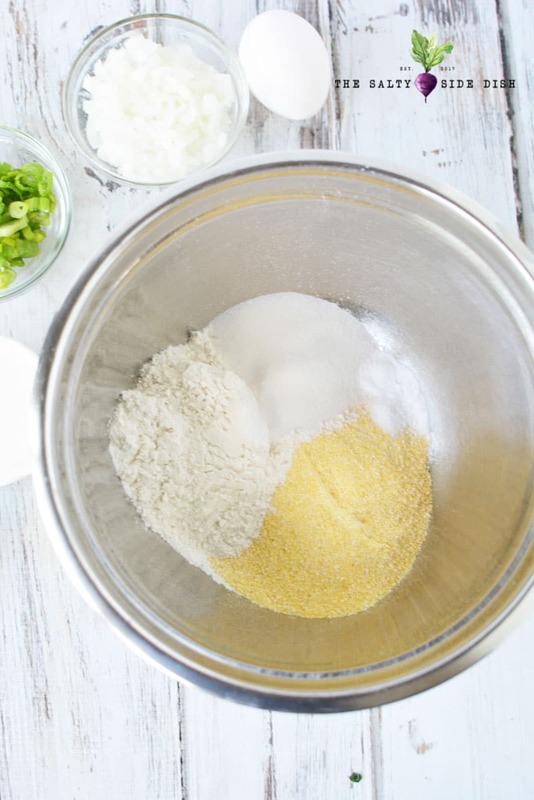 In a mixing bowl, add cornmeal, flour, sugar, baking soda and salt. Mix well. 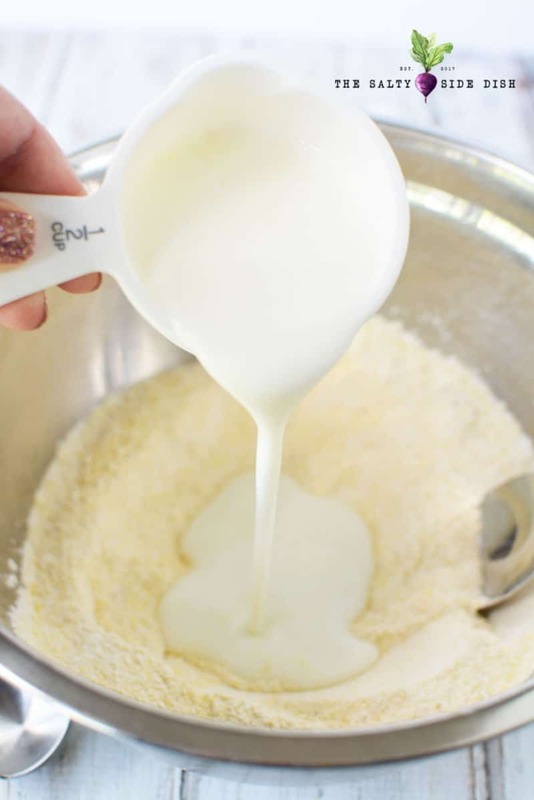 Make a well in the center of the dry mixture and add buttermilk, oil and egg and mix well. 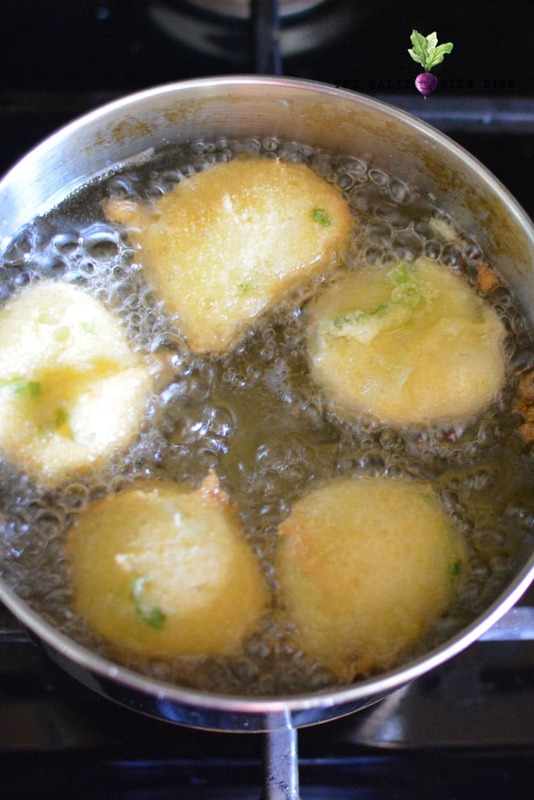 Using a 2 tablespoon portion scoop drop dough into hot oil and fry for 5-7 minutes or until golden brown. Turn frequently to evenly cook. When finished cooking, place on paper towel for oil to drain and serve warm. Hush Puppies recipe for a Golden brown fried ball and the perfect amount of crispy crunch, mix and go hush puppies are delightfully easy to prepare and can feed an entire crowd. Heat at least 2" of vegetable oil until hot. 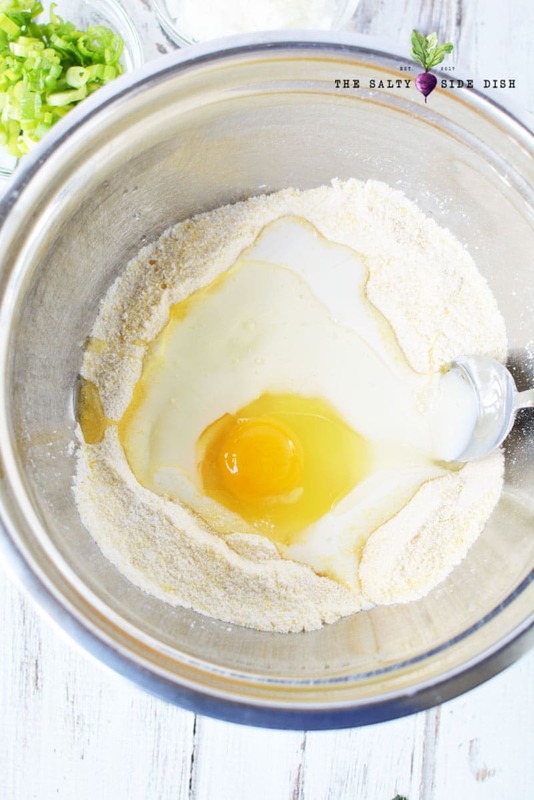 Make a well in the center of the dry mixture and add buttermilk, oil and egg and mix well. Stir in onions. Using a 2 tablespoon portion scoop drop dough into hot oil and fry for 5-7 minutes or until golden brown. Turn frequently to evenly cook. When finished cooking, place on paper towel for oil to drain and serve warm. Carb counts provided by Carb Manager. I’m going to try this Friday, it’s the exact to my Mother’s, except the buttermilk, I don’ t know if she used, though we had it in the fridge. Thank you for this RECIPE, I already know it to be perfect!! Hi Jeraldine, your mom sounds like an amazing cook! 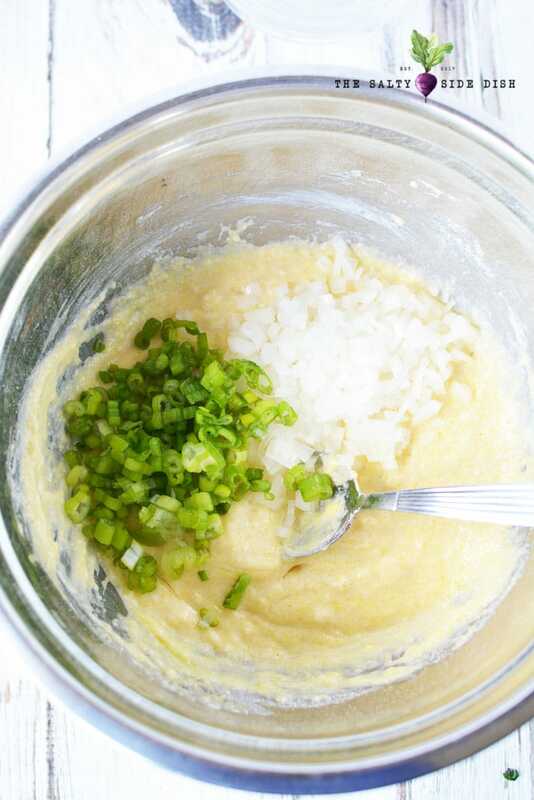 Let me know if you like the recipe this way or I should try Hush Puppies her way!